The Torrent 4100 focuses on testing Mobile IP, in particular FAs and HAs, and unlike its other counterparts is a native IP test system where the mobiles directly send IP packets into and receive packets from the network. 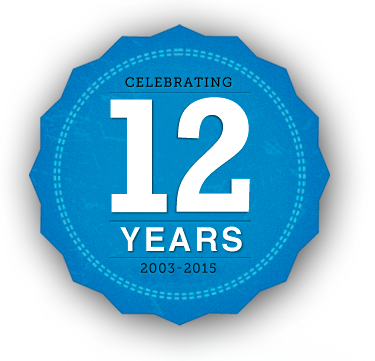 Our rich protocol support includes: HTTP, WAP, MMS, PTT, SIP, RTCP, RTP, FTP, SMTP, POP3, ICMP, DHCP and DNS. Support for SIP, RTCP and RTP is built in to the simulator in accordance with the Push-to-Talk over cellular (PoC) specifications. One useful aspect of this traffic class is that it allows you to see how well the system prioritizes the conversational traffic class over other traffic classes. To our knowledge, no other tools vendor supports push-to-talk traffic testing today for the GPRS/UMTS core network. HTTP is one of the main TCP application types that is built into the simulator. Both the GET and POST methods are supported and headers may be arbitrarily configured. Both WAP 1.2 and 2.0 are supported; and a WAP gateway is packaged with the system to make using WAP a turn-key process. Support for MMS messaging over WAP 2.0 is built in to the simulator and it includes an MMSC implementation on the NTS-4100. Both synchronous and asynchronous mobile originated pings are supported; that is, mobiles may generate pings and wait for a response (with built in timeouts/retransmits), or they may just send the ping and continue. Downlink pings to mobiles are also supported. UDP echoes are supported in a manner very similar to ICMP echoes, except that downlink echo responses may be of variable size and quantity. That is, for each uplink echo there may be N downlink echo responses of an arbitrary size. FTP support is built into the simulator and is particularly useful as a background traffic class. Mobiles may send and receive e-mail using standard mail protocols through arbitrary mail servers. Mobiles may optionally resolve names to IP using DNS (over GTP), which is another realistic and unique feature of the Torrent 4100 WTS. Arbitrary traffic, for example HTTP sessions from a web browser or WAP 2.0 sessions from a WAP simulator may be forwarded through the simulator allowing numerous content types to be tested. Both primary and secondary contexts are supported in this mode of operation. The MTS-4100 is capable of simulating up to half a million sessions from a single PC. 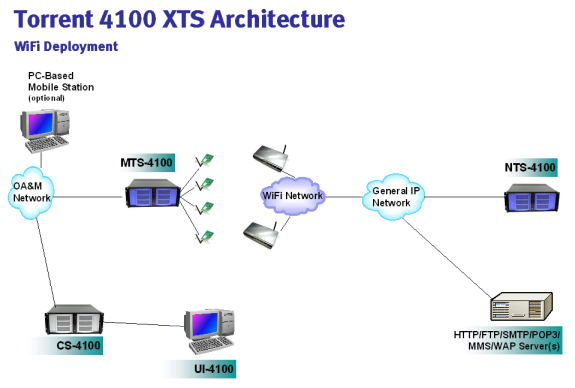 The MTS-4100 can interact with real application servers on all traffic types except for MMS and PTT. In these cases, it only interacts with the NTS-4100. Because the MTS-4100 drives so much of the system, its capabilities are very intertwined with the discussion in Key Features and Traffic Types. You can quickly verify basic system sanity. You can reproduce specific user actions occurring in field issues. You can examine system performance from a user perspective. It's also possible to run multiple PC-based Mobile Stations through the MTS-4100. The FA-4100 is a fully functioning Foreign Agent. One useful role it can play is to eliminate the need to create a Foreign Agent function if you are testing your Home Agent. The HA-4100 is a fully functioning Home Agent. One useful role it can play is to eliminate the need to create a Home Agent function if you are testing your Foreign Agent. One advantage of the CS-4100 / UI-4100 is that key information about a test run is presented all in one place: results, statistics, histories and more. For example, a user can examine more than 450 Gn and Gi statistics, including packet loss and latency, organized hierarchically to see the big picture or the fine details. Statistics can be observed in user windows or exported to Excel. HTTP GET: Any NTS HTTP URL will be accepted. The NTS-4100 will return a block of data that is configured to be either fixed or randomly sized. HTTP POST: Any uplink data may be posted to any NTS HTTP URL. MMS SEND: The target of the MMS message is ignored. The data is always sent back to the sending mobile. FTP GET: Any file path name will be accepted. The returned result (a downloaded file) will be a data block configured as fixed or randomly sized. SMTP SEND: Mail to any address is accepted and discarded. POP3 GET: Mail is always available and a small, fixed-size e-mail can always be retrieved. PTT: No significant restrictions, except that group list management operations are not implemented and neither is SIP compression. RADIUS: Support for RADIUS is built into the NTS-4100. Includes support dynamic user address assignment. 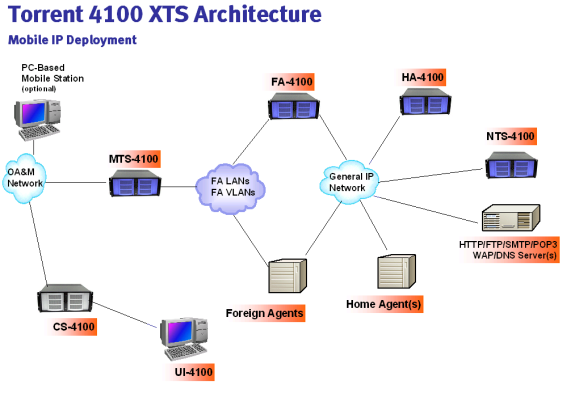 In addition, the NTS-4100 offers a built-in UDP echo server, to echo packets sent by the MTS-4100. Finally, the NTS-4100 rounds out your view of the network with its own set of hierarchical data traffic statistics from the network perspective. The CS-4100 server automatically configures, starts, and directs the MTS-4100 Mobile Traffic Simulators and NTS-4100 Network Traffic Simulators to run tests as instructed by the user through the UI-4100 GUI (either manually or via a test case).